Looks like an encryption battle is looming in Silicon Valley! 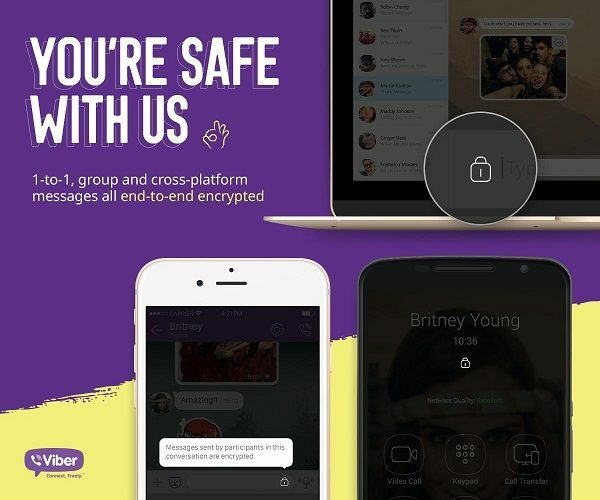 As of Tuesday April 19th 2016, Viber, the VoIP and mobile Social Network wannabee, has implemented end-to-end or E2EE encryption on all their communications as per their blog post Giving Our Users Control Over Their Private Conversations. E2EE will be rolling out to the rest of the World in the next few weeks, so all users, not just Americans, will have their observations protected. So why are they doing this at this time? Their action follows those of Apple and more recently WhatsApp who have now implemented end-to-end encryption on all their communications. In February 2016, Apple and the FBI (Federal Bureau of Investigations) got into a dispute over a request to hack into the encrypted iPhone of San Bernardino shooter Syed Farook. The FBI allegedly got third party help, albeit they’re not giving Apple details. Still the rest of Silicon Valley isn’t taking any chances. On Tuesday April 5th 2016, WhatsApp, the popular Mobile Social Network owned by Facebook, implemented end-to-end encryption on all communications among their more than 1 billion users. What’s best of all is that the encryption key resides with each smartphone that has WhatsApp installed. So even if WhatApp was asked to hand over data by the FBI, they couldn’t comply, as they don’t have the encryption keys and neither do the user. Simply put, only the sender and recipient of the message can see the message to quote WhatsApp co-founders Jan Koum and Brian Acton in their blog post titled end-to-end encryption, quote: “The idea is simple: when you send a message, the only person who can read it is the person or group chat that you send that message to”. So how do you activate their end-to-end encryption? To activate end to end encryption on Viber, you need to update you current version of Viber to the latest version. However, unlike WhatsApp, Viber is also rolling out this feature automatically, with some additional perks to go along with E2EE. Viber also introduced a new hidden chats feature. Basically, you most private conversations are removed from you logs, encrypted and stored under a PIN (Personal Identification Number) lock. Good luck to the FBI trying to interrogate me to have me yield up my PIN. Also, each user gets a set of cryptographic keys unique to their device to help you authenticate your identity to other Viber users. The Red Lock Icon become activated if someone is using an infected router to spy on you conversations or the persons you’re talking to has a compromised smartphone. Re-authentication will get the lock back to green, assuming you trust the persons on the other end, as at the end of the day, he’s the weakest link in keeping your conversations secret. Something tells American telcos may soon be pressured by their corporate and Enterprise customers to consider rolling our encryption as a VAS (Value Added Service). After all, if it’s that easy for hackers to crack your smartphone, what’s to stop the FBI, the CIA and the NSA, who already have agreements with foreign powers to spy on your conversations as pointed out in NSA and Five Eyes Alliance in Project Irritant Horn Spying on Arab Spring Jihadists. Local Telecom Providers such as FLOW Jamaica and Digicel Jamaica, who may soon be launching 4G LTE (Long Term Evolution) in May 2016 as predicted in How Digicel’s and CellOne LTE in Bermuda means 75 Mbps speeds coming to Jamaica may want to consider the use of encryption as well as American tourists may also demand this particular service. Folks, this isn’t over….expect more announcement from Silicon Valley as they go Dark, Flight of the Condor Style!